Provides 50-100% of the children's RDA for an array of vitamin and minerals. 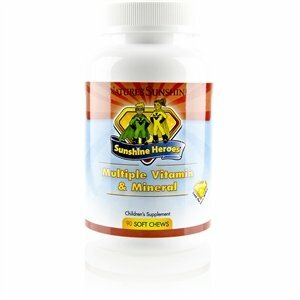 Sunshine Heroes Multiple Vitamin & Mineral provides 100% of the Recommended Daily Allowance for vitamins A, C, D3, E, B6, B12, folic acid, biotin, pantothenic acid and zinc. Sunshine Heroes multiple vitamin and mineral contains protector shield blend, a whole food blend of 17 fruits and vegetables. These fruits and vegetables provide powerful phytochemicals nutrients and antioxidants - potent plant compounds noted for their health-protective benefits. Protector shield blend provides choline, inositol, and 10 amino acids - essential nutrients for growing children.Pediatricians recommend a daily multiple vitamin and mineral supplement for children who may not eat regular, well-balanced meals with lots of fresh, whole foods; picky eaters; children with high activity levels; children who eat a lot of fast food and processed foods; and children who eat dairy-free or other restricted diets. A multiple vitamin and mineral supplement is also recommended for children who may drink a lot of carbonated sodas, which can leach nutrients from the body.